I regularly send out-of-town cheesesteak pilgrims to Pat's and Geno's -- for the neon, the scene, and history every bit as significant as the Liberty Bell. 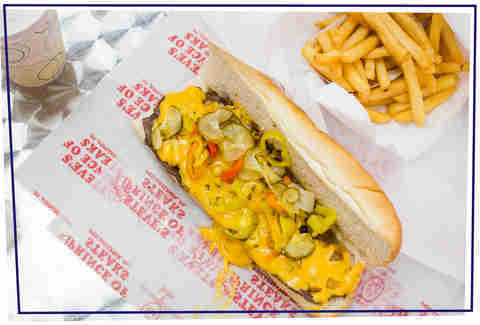 When it comes time to actually eat, though, there are better cheesesteaks in Philadelphia, one of which can be found a mere five minutes away from Pat's and Geno's iconic cheesesteak triangle. You just have to know where to look… and after nearly 20 years studying and eating cheesesteaks across the city, including visits to more than 60 stands to produce The Great Philly Cheesesteak Book, I have more than a few ideas. You don't have to be from Philly to love cheesesteaks, but it helps. They're a part of Philadelphia history that literally becomes part of us -- at least once a week for 17% of city residents, and daily for another 4% (per a 2006 survey from Philadelphia Magazine). Philly's population is just over 1.5 million, so if these numbers are correct, that's more than 60,000 Philadelphians who eat a cheesesteak… Every. Single. Day. This simple sandwich of bread, meat, cheese, and onions is an embodiment of Philadelphia’s in-your-face, blue-collar culture. Cheesesteaks are not artisanal and they are not gourmet. They are street food, which needs no apology or upgrade from truffle oil, aioli or anything else. It all started one day in 1930, when hot dog vendor Pat Olivieri, fed up with eating his own product for lunch every day, visited a nearby butcher and got him to slice some meat thin enough to cook it on his hot dog grill. Pat’s lunch was interrupted by a cab driver who came by for a hot dog and upon seeing Pat’s sandwich, asked for a bite -- and suggested Pat start selling it. This isn't to say Pat was the first person to ever sell hot beef sandwiches on the streets of Philadelphia up until that point. During the Depression, the streets around the Italian Market in South Philly were full of immigrants like Pat peddling lunch made with hearty Italian bread from local bakeries and low-grade pieces of meat or offal. What made Pat unique wasn't so much his steak product (and initially it was just steak -- cheese didn't become standard until the early 1950s), but his ambition and marketing savvy. Instead of standing at his cart on Ninth Street waiting for customers, he went down to the city’s music halls and theaters to give the stars free sandwiches, and get them to pose for pictures that you can still see hanging at his successor stand today. That star power rubbed off on Pat, his shop, and his sandwich, both locally and beyond. Soon competing steak shops sprouted up all around town, leaving us with the happy problem of finding the best. First off, you want a super-fresh roll that's soft on the inside, but crusty enough on the outside to hold up to a mighty mess of cheesesteak ingredients. Second, the cheese needs to be noticeable but not overwhelming, which is why I (and most other Philadelphians, statistically speaking) prefer American to Cheez Whiz or provolone, with their stronger flavors. This cheese is preferably melted atop the meat and mixed in on the grill, versus put on the meat or bread cold from the fridge. The onions shouldn't be raw, but also not so caramelized in the cooking as to resemble ketchup. Lastly, and perhaps the hardest to find: You need beef that actually tastes like beef and has the texture of steak, without being tough or gristly. All four of these ingredients should be balanced -- no one component should dominate or be better than the rest -- and come together in a way that creates that unmistakable cheesesteak flavor. You should not bite into a cheesesteak and think "Great cheese!" or, "Incredible bread!" You should just think, "This is a fantastic cheesesteak!" Important note: Notice I didn't mention hot peppers, sweet peppers, hot sauce, pizza sauce, ketchup, mayonnaise, or mushrooms. I know some people swear by these additions, but too often they serve as a crutch for an only-OK cheesesteak. A great cheesesteak doesn't need anything but the four basic ingredients. 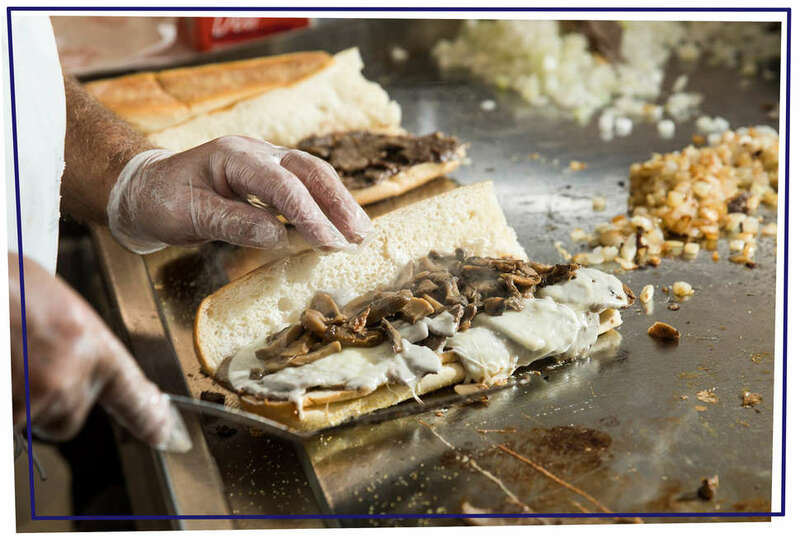 Especially here in the city of its birth, a cheesesteak's greatness is as much about the place that sells it -- and the people who serve it to you -- as the actual bread, meat, onions, and cheese. People from out of town will frequently complain about local steak shop employee rudeness, or spaces that are dumpy/not the cleanest, to which I say: If you want fancy atmosphere, go to Vetri. I’d rather a cheesesteak joint put its money in the meat, and if you want politeness, move to Minneapolis; directness is in Philly’s DNA. In the case of cheesesteaks, it's also a result of local operator's knowledge, pride and/or tradition. They are not going to serve you Cheez Whiz at John’s any more than they would at Vetri, and for similar reasons: because they think it's crap and will ruin the food. You follow the rules for standing in line and ordering because it means everyone gets their sandwich quicker. As every local knows: the general rule and tradition, especially at high-volume shops, is to order by saying the name of the cheese that you want, followed by "with" or "without," which means with or without grilled onions (i.e., "Whiz with" or "American with"). 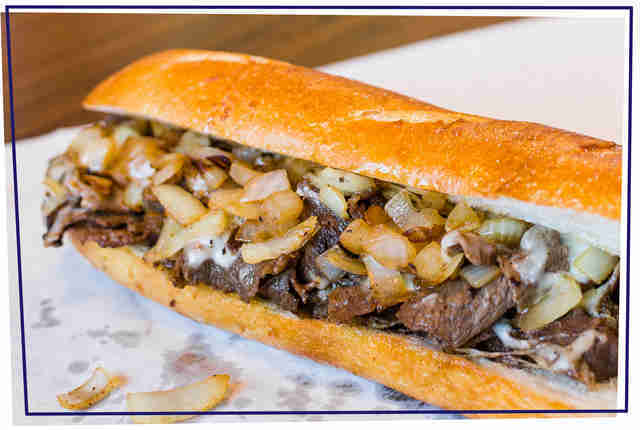 Firstly, we're only talking about cheesesteaks within Philadelphia city limits here; great cheesesteak places in nearby Delaware, Jersey, and the rest of Pennsylvania are another delicious story. We're also only talking about places who only or mainly make cheesesteaks, which is usually evidenced in their names. Almost every diner, pizza place, outdoor cart, and cafeteria in Philadelphia makes a cheesesteak, some of them undoubtedly quite good… but their lack of commitment is troubling. As previously suggested, I also favor places with an interesting history, location, or backstory, although pedigree alone isn't enough: They also have to deliver on the food today. Joe’s is time travel served on an Italian roll, from its hand-pumped chocolate Cokes to its wooden booths to the steaks themselves, which are sliced in-shop rather than unwrapped and defrosted on the grill. Their egg creams, malteds, and shakes, made with real milk and Turkey Hill ice cream, are both unusually good and unusual for a steak shop -- a vestige of Joe's origins as a soda fountain. The Happy Days-set-looking Fishtown location opened on Frankford Avenue's restaurant row in 2015, and serves equally good food in addition to being much easier to get to on public transportation, but the original Torresdale Avenue spot (opened in 1949) offers the more interesting, authentic experience. Tony Luke Jr. is a Philly cheesesteak star. Appearing in cable TV ads for the shop (and later, in multiple Food Network shows and promotional videos for his franchise stores), he became a worthy successor to the steak-shop-owner-as-colorful-celebrity tradition started by Pat Olivieri. The Luke family (actual name: Lucidonio) also began to mimic the Olivieris' habit of airing their dirty laundry in the courts, and the upshot of a 2016 lawsuit and counter-lawsuit is that Tony Jr. no longer has direct involvement with this, the family's original Oregon Avenue stand. Its Tony Luke Jr. media gallery decor is also no more. Drama aside, this stand's slab-style "American with" was actually my favorite of more than a dozen cheesesteaks I recently tried (or retried) at local shops. (Their Steak Italian -- with greens and cheese -- is a specialty, but I believe in comparing American withs to American withs.) Despite its near quarter-inch thickness, the meat is uniformly tender and infused with warm cheese and sweet onions. And the roll's crust gives a satisfying crackle when you bite, likely a result of the way Tony Luke’s completes baking of their Liscio rolls on-site. Dalessandro's should be on the short list of every lover of steaks "with." Their onions are hand-sliced, then sautéed in an olive/vegetable oil blend and left to simmer on the grill in a mound for hours. The result is a glistening stew of sweetness, made even more delicious when leavened by Dalessandro’s almost equally famous house-roasted long hot peppers. The meat base is finely chopped rib eye, cooked up in an eccentrically adapted former corner grocery. There's a sink where customers can wash their hands in lieu of a loo. Folding chairs and tables along two big plate-glass windows lend their occupants a prime view of the butts of the people eating at the small counter or, during busy times, the butts of the people standing in line. Yes, lines. It's definitely because of the food. John’s is an exception to my rule about only considering stands that self-identify as steak shops. One, because great cheesesteak and great roast pork places are often one in the same and two, because John Bucci Jr.’s finely sliced and chopped steak sandwich is exceptional. The walls of his cinder block shack in deep South Philly are lined with awards and articles from people who agree. Why all the fuss? It's because of the care John's lavishes on every sandwich: grilling the beef loin to order, scooping out the center of the hefty Carangi rolls so all 12 ounces will fit, protecting their customers from the Whiz. It's also because this business is more than just a business -- it’s a family inheritance, dating back to 1930, when John’s grandfather, Domenico Bucci, began selling roast pork from this same bleak spot by some railroad tracks. John Jr. introduced the cheesesteak in 1978 and now runs the place with family members who add their own spice to the John's experience in the form of shouted instructions to those not familiar with their paying and ordering ways. Steve Iliescu has been the Prince of Steaks in Northeast Philly since he opened his first stand near the Roosevelt Mall in 1980 -- the name was both in tribute to Pat's King of Steaks, and his claim to successorship. In recent years he's made moves to expand his kingdom into Center City, and most recently, West Philly. The 16th Street shop, run by Steve’s daughter Abbe Arno, recreates his original Northeast stand in a generic downtown storefront down to the patterned diner steel. 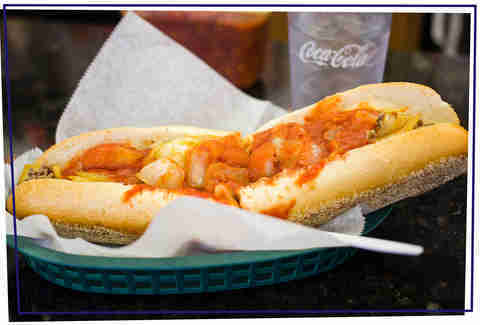 The sandwich is also an exact clone of Bustleton Avenue’s brawny combination of slightly chewy (but not tough) thick-cut meat, a fresh roll, and Steve's unique melted American that blends with the meat juice to create a delicious drip. Tourists eat at Pat’s or Geno’s; locals who know better drive five minutes southwest on Passyunk Avenue to hit up Philip’s. This place has the same outdoor stand design, traffic island setting, 24/7 schedule, and slab-style rib eye of the famous East Passyunk cheesesteak triangle, but without the long lines (and with better-quality meat). The old-fashioned -- a pizza steak with fresh tomatoes instead of tomato sauce -- is a favorite here. Philip’s also has some street cred: namesake Philip Narducci spent decades in federal prison for racketeering, and is now facing new charges of extortion and conspiracy. I'll confess to an eyeroll upon first seeing Cleaver’s website and its “artisanal ingredients” and “gourmet sandwich” boasts. As previously discussed, cheesesteaks are proud street food. Some of the menu options here are also highly nontraditional, like a buffalo chicken sandwich with blue cheese dressing, or an all-veggie option featuring raw baby spinach with balsamic glaze. Then you've got Cleavers’ sleek Center City digs in the former home of an upscale burger joint, complete with bar, flat-screen TVs and loud contemporary music soundtrack. Old fashioned, this is not. And yet… Sibling co-owners Electra and Dimitri Poulimenos are the second generation of one of the families behind Astra Foods, an Upper Darby company that supplies steak meat to food service operators. So, as Electra says, “We know meat.” Electra backs up that statement with a domestic rib eye steak filling that's halfway between slab and chopped, 100% tender and wholly satisfying. Electra and her brother also know rolls, judging by their choice of Conshohocken Bakery, which produces a wonderfully firm and flavorful roll that's rarely seen outside its own Montgomery County. Call me a Cleavers convert. Walk across Sonny’s creaking wood floor to glimpse the shop’s stainless steel open kitchen and simple menu, and you might believe it dates back to Pat and Jim days. It’s actually a 17-year-old re-creation/tribute to those stands from Ellen Mogell (of Honey's Sit N Eat upscale diner fame). There is no Sonny, either; Mogell was just looking for a name that sounded Italian. That said, this is a case of a student outperforming their teacher, with tender, flavorful ribeye slabs on soft rolls, and slices of American or provolone melted on the meat. Sonny's prime location and late weekend hours make it a popular stop post-clubbing in Old City -- your call as to whether that's a good or bad thing. Pat's and Geno's may have the neon glitz, but Jim's is the only one of the big cheesesteak three that has the sandwich goods. 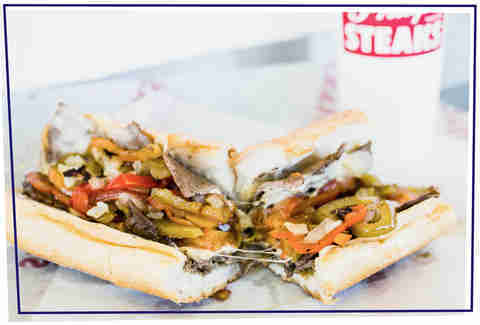 It's is one of the few shops in town to make their cheesesteaks with top round -- rib eye is generally the cheesesteak meat of choice, but rib eye can be as fatty, gristly and tough as it is flavorful. Top round doesn't have those same problems, at least not the way it's served at Jim's: finely chopped and blended in with big chunks of caramelized onions and without a hint of sinew. There was also, for whatever reason, not much of a hint of my American cheese, so Whiz might actually be the better choice here. A cameo in Creed put Max’s on the map of cheesesteak fans across the city, but it’s not the only popular or good old steak shop in North Philly. Pagano’s is a takeout-only storefront, marked by a classic old moving neon sign and famous for its large sandwiches. The steak is chopped and, unless specified otherwise, automatically dressed with ketchup as per North Philly's neighborhood preference; ketchup also helps cut down on this meat’s slight dryness. Keep an eye out for the framed pictures of past and current employees here, which sit alongside the expected ones of celebrity patrons (like Joe Frazier, Ving Rhames, and former Mayor Michael Nutter). Cheesesteak connoisseurs don’t blink at spending $9-12 (and waiting up to an hour) to get one of the town’s premiere examples, but if you’re among the 4% (of previously mentioned daily cheesesteak eaters), time and money matters. And by those standards, Little Pete’s $6-and-change cheesesteak shines. This is a chopped-style steak, cooked to order with your choice of cheese, and placed on a fresh roll with quarter-sized onions while you wait (in a very short-to-nonexistent line) at the enclosed walk-up counter. Though not as flavorful as the pricier competition, Little Pete’s is also not tough or chewy, and doesn't taste like hamburger (the telltale sign of a steak made from low-cost meat potpourri). Little Pete’s red-and-white low-slung building is also a beacon of cuteness in the industrial wasteland just off I-95/Cottman. More than that I cannot say -- because in this era of endless self-promotion, Little Pete isn't really interested in publicity.